Viewing a Google 360 virtual tour of your space on a mobile phone is like placing your business into the palm of prospects’ hands. Nothing gets me more excited than exploring new cafés or shops in Chicago—but often times I want to be able to envision what it will be like before I even arrive. I also like to “visually” know how to get to my destination. Driving in Chicago is enough of a headache as it is! I know I’m not the only one who will agree with this. One weekend afternoon, I was searching through Google maps on my phone for cafés in Chicago—Lakeview to be exact. While searching, I noticed that one café had a “see inside” option. After I clicked to see inside, I was able to navigate through the inside of the café. Beautiful lighting, nice spots to sit with my friends for tea, and part of the café was a shop to bring some tea home. This was the spot. I hit the button for directions, and Google showed me how to get there. The mobile view of the Google 360 virtual tour of the café was the thing that truly sold me on going. A Google 360 tour provides users with a way to see what it looks like to sit in your office for a meeting, to walk inside your shop, to sit at your bar, or to eat at your café. They want to see it! Why should I go, and how far is it? Does it look like a place that I want to shop at? Is this the kind of place I want to have a drink or sit down for coffee? These are all possible questions that people ask before venturing out. When people can “mentally” see what it’s like to be in your space—and they like it—they are probably more likely to visit. Now is an extremely exciting time for businesses to enhance their digital presence. Typically, businesses will work with a trusted Google-certified photographer who will take the photos and submit them to Google for a final review. At Design & Promote, we partner with a trusted Google photographer, and we work around a business owner’s schedule to take the photos of their space. Time to complete the project depends on how big your space is. For instance, we shot an entire indoor sports complex in about 2 hours, including prepping, taking the pictures and reviewing the photos. If people are in the photo, Google will blur out their faces. After that, it typically takes up to two weeks for the tour to go live on Google. A Google 360 tour is linked to your Google places account so that when users search for your business in maps, they can see it along with the “see inside” feature. Thankfully Google made their site and apps fully responsive for desktops, tablets and mobile phones. The 360 business view is available on Google search, Google maps, and Google+. In a competitive food industry, Chicago businesses need to stand out. Powerful imagery can put any business at an advantage. 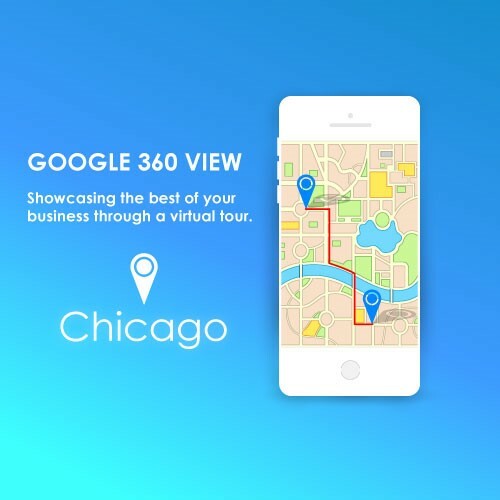 If you want more information on getting a Google 360 virtual tour for your Chicagoland business, reach out to us. Placing yourself on the map is like placing your business in the palm of your prospects’ hands. It’s also an affordable and fantastic way to boost traffic to your website and to your business’s doors.